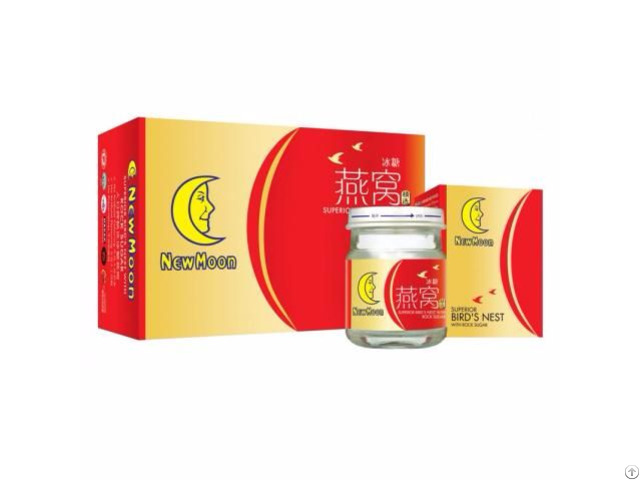 New Moon Superior Bird’s Nest with Rock Sugar is made from superior grade 100% genuine bird’s nest. It is an ideal food supplement for all ages. New Moon Superior Bird’s Nest with Rock Sugar is prepared according to traditional simmering process under modern and strictly controlled methods. It can be consumed directly from the bottle, chilled or warmed, according to individual preference. Ingredients: Water, Rock Sugar, Bird’s Nest, Permitted Stabilisers. Keep refrigerated after opening and consume within 12 hours. Business Description: Founded in 1940s, the company has steadily established a vast network of distributors while retaining our expertise in providing prompt and quality service regionally. The secret to Goh Joo Hin's success lies in our ability to maintain our history of prompt and reliable service in the international markets spanning Asia and Pacific region. Countries include Singapore, Malaysia, Indonesia, Brunei, Vietnam and the Philippines.In addition, Goh Joo Hin's extensive warehousing and distribution system ensures direct and immediate supply of ready stock to customers throughout the region. Goh Joo Hin's success in the international arena is reinforced by a commitment in providing comprehensive customer service through rapid sourcing power, the ability to respond immediately with prompt delivery and our guarantee on all our products. As such, trust and loyalty forms the essence of our basic business philosophy. In line with our continued efforts to improve and modernise, the company's plans include expansion to a bigger and better premise. Goh Joo Hin Pte Ltd's mission is to fulfill its commitment as the leading marketing and distribution Company of the highest quality. Goh Joo Hin Pte Ltd's objective is to become a world-class organisation with its quality house brand products distributed and marketed regionally and internationally. Since its founding back in the 1940s, Goh Joo Hin Pte Ltd has steadily established a vast network of distributors while at the same time retaining its expertise in providing prompt and quality service regionally. The secret to the company's success lies in its ability to maintain its history and reputation of prompt and reliable service in the international markets spanning the Asia Pacific region. The countries that Goh Joo Hin Pte Ltd distributes its products to includes Brunei, Cambodia, China, Hong Kong, India, Indonesia, Japan, Korea, Malaysia, Middle East, Philippines, Russia, Sri Lanka, The Republic of China (Taiwan), Thailand, United Kingdom and Vietnam. In addition, the company also setups regional offices and appoints distributors for better execution.